Look out for the two idjuts pretending to hoist the halyards, sheeting sails and weathering the storms whilst the “Kaptein spans his seile” – although I don’t think that Kurt is going to sail over the horizon in the Mirror Dinghy below! We have one suggestion for you Kurt – pop along to the Boardwalk Hobie 16 Nationals from 27 to 30 April and take a sail on a real speed machine that will take you to ‘myne’ a whole lot quicker. Kurt Darren’s the captain and his ship of platinum hits is about to launch on Friday 17 February (two days before his 19 February birthday) at the Boardwalk’s Vodacom Amphitheatre in Port Elizabeth. Darren needs little introduction and his legions of fans have ensured that as many as 36 of his songs have gone platinum. He is also riding the crest of television popularity with appearances on KykNet’s Jukebox and through his weekly Radio Jacaranda show. To date, Kurt’s accolades include 14 solo albums. 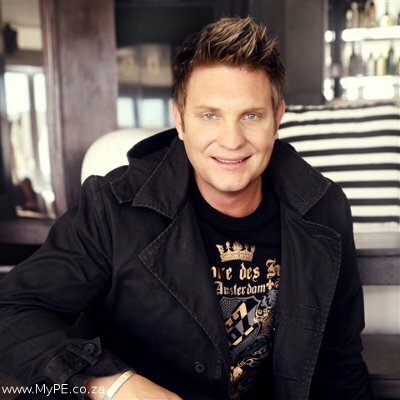 His hit Meisie Meisie has been recorded by a German group called Klostertaler and over ten other hits have been translated for audiences in Belgium, the Netherlands and Germany. These include Hemel op Tafelberg, Staan op, Alleen, As jy my wil he and Se net ja. A five piece orchestra and four talented dancers will join Kurt on stage during his platinum tour. The show starts at 19h30 on 17 February and tickets are available from Computicket at R135 for adults and R60 for children. Grab your copy of Kaptein by Kurt Darren from Kalahari. Kaptein – span die seile. Kaptein – sy is myne, daar waar die son opkom, daar oor die horison wag sy vir my. Kaptein – span die seile Kaptein – sy is myne daar waar die son gaan lê, het sy gesê sy wag oh oh oh oh oh oh sy wag vir my. Eendag lankgelede in my drome was daar ‘n girl soos jy en sy was ver te mooi vir my. Daar was ‘n eiland vol meisies in bikinis en almal lyk soos jy en dit was ver te veel vir my. Eendag op ‘n reëndag ons alleendag dit was net ek en jy ons het mekaar in ‘n droom gekry. Daar was ‘n eiland vol kinders by dosyne en almal lyk soos jy en dit was mooier as mooi vir my. Kaptein ek wens jy wil my hoor. Kaptein ek wens jy wil ek gaan my droom verloor. Sign up for Port Elizabeth’s Massive Deal to be in the running to get a set of Double Tickets to the show.